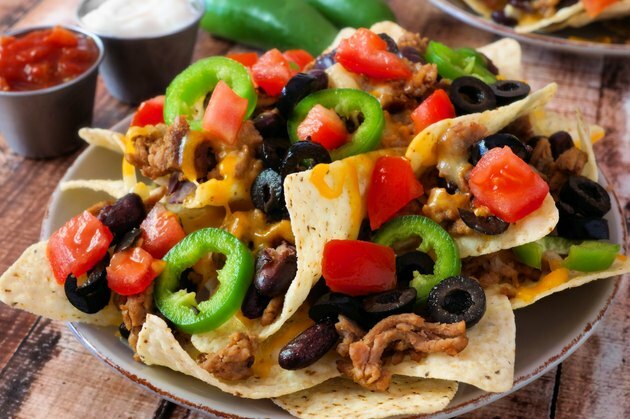 Many Americans eat nachos for lunch, dinner and snacks and at sporting and other events, potentially making nachos a culprit in the obesity epidemic. Although Americanized nachos typically include diet-busting fried tortilla chips topped with glue-like orange cheese, you can prepare and enjoy nachos in a way that is good for your diet. In fact, you can turn nachos into a healthy go-to meal or snack. Crunchy tortilla triangles create a nest for the rest of your nacho ingredients. Unfortunately, fried chips are high in fat and calories. The American Heart Association recommends you avoid fried tortilla chips and fried tortilla shells. Use baked tortilla chips for healthier nachos. Dawn Clifford, a registered dietitian at Carl T. Hayden VA Medical Center, suggests cutting whole-wheat tortillas into triangles and lightly broiling them for crispness. You can prepare corn tortillas the same way. If you wish to include meat on your nachos, brown lean ground beef, turkey or chicken and season your meat with chili powder, pepper and cumin. Beans provide heart-healthy protein and fiber for your nachos. Canned beans offer convenience and variety. Include pinto or black beans. If you choose to include refried beans, be sure to check the labels to help you avoid lard-ladened brands. Cheese is the crowning glory of nachos. Choose cheeses that provide plenty of flavor in a small serving to control calories and fat content, such as sharp cheddar or pepper-jack cheese. Avoid canned cheese sauces. Top your nachos with a measured amount of cheese and place the dish under the broiler to melt the cheese. Nachos make a great base for a variety of vegetables. Pile your nachos with shredded lettuce, chopped tomatoes and onions, and sliced jalapenos. Sliced avocados or olives provide a serving of heart-healthy fats. Consider switching fresh spinach for the traditional iceberg lettuce and sprinkle plenty of colorful, chopped bell peppers on top.